Philadelphia Daily News sportswriter Jenice Armstrong has today what for many will be an essential piece of Super Bowl lead-up reading. 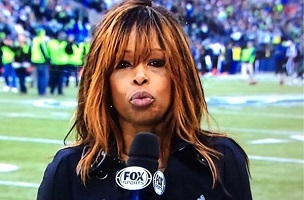 A chat with Fox News sideline reporter Pam Oliver about the reaction to the latter’s now infamous NFC Championship hair. Armstrong blogged, the day after the Seahawks-49ers contest, about the social media brouhaha that resulted from Oliver’s loud do. From FishbowlNY’s perspective, the TV reporter should be thankful that on Sunday January 19, the owner-operator of the Twitter account most logically positioned to take advantage of it all – @Chewbacca – was dormant. In the article, Oliver goes on to make some great points about the double-standard applied to the appearance of male and female sports broadcasters. And confirms throughout that she has her feet planted firmly on the ground when it comes to the overall importance of this kind of social media nonsense. Read the rest of the Daily News article here.